Announcement Posh Patterns. Crochet patterns and knitting patterns for children, babies, kids, women, and men. Learn how to sell your crochet and knitting and earn a full-time income! 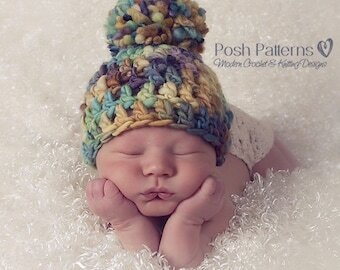 Posh Patterns has patterns for slouchy hat patterns, beanie patterns, cowl patterns, scarf patterns, hooded patterns, baby patterns, photography prop patterns, and more. Do you like FREE PATTERNS? Visit my blog! http://www.poshpatternsblog.com. Buy 2 patterns and get 1 free! Use code "FREEPATTERN"
Posh Patterns. Crochet patterns and knitting patterns for children, babies, kids, women, and men. Learn how to sell your crochet and knitting and earn a full-time income! Haven't tried it yet, but looks really good. Thank You Much! Working on a new design with a gorgeous cashmere blend yarn. It's so soft!! Working on a custom hat order using this slouchy hat pattern. The shade of green is going to be pretty!! Elegant and classic crochet patterns and knitting patterns. My adventures in knitting and crochet began about 18 years ago, when my younger daughter was born. It quickly evolved into a much-loved hobby, beginning with crochet, and knitting to follow. I essentially taught myself how to do both, mainly with how-to books from the library. My hobby soon led me to designing my own projects, and then eventually into a business of designing. My patterns and designs range from classic and elegant accessories, to fun and whimsical pieces--all of them perfectly suited for kids and grown ups alike! I really like to get my inspiration from anything that draws my eye. And, when a scarf, hat, or accessory of any kind gets my attention and makes me think, "that looks like it would be wonderful to wear," I try to design something that would make others think that too. I also take great pride in the way that I do the technical writing for my patterns, and I strive to produce very clear and logically written directions. Since I had only been crocheting and knitting for short amount of time, before I began designing, it was almost out of necessity that I wrote them in a way that was simple and easy to understand. I send all of my patterns to "pattern testers," so that they have the greatest chance of accuracy. Only after I receive the green light, from them, do I offer my designs for purchase. Another important aspect of my business is the level of customer service that I provide. I feel that it's incredibly important to be there to answer questions from your customers, should a question arise. Thank you for taking the time to read about my shop! When will my pattern, or item, ship? Most of the items in my shop are instant download crochet patterns and knitting patterns, so those will be available immediately after payment is made and clears. To access them after your purchase, go to the "purchases" page of your Etsy account and you'll see the purchase information for the item, and a download button. Ready to ship items will be packaged and shipped the following business day, after payment is made and clears. Made to order items will be shipped the day after it is finished, which is currently about 2-3 weeks from the purchase date. Are your patterns written in U.S. English terms? Yes, all of my designs are written using U.S. English terms and abbreviations. What format are the instant download patterns in? All crochet patterns and knitting patterns are in PDF format. Are your crochet pattern and knitting patterns available in other languages, besides English? As of right now, the answer is no. I am always on the lookout for an accurate and easy way to have them translated, and as soon as I find that way I will offer them in other languages. Custom orders will only require an inquiry with me, to make sure that the proper yarn is available for a specific item. If you are interested in a custom order, please feel free to contact me!